There are many things you can do and see during your Komodo island tour from Bali and Labuan Bajo. 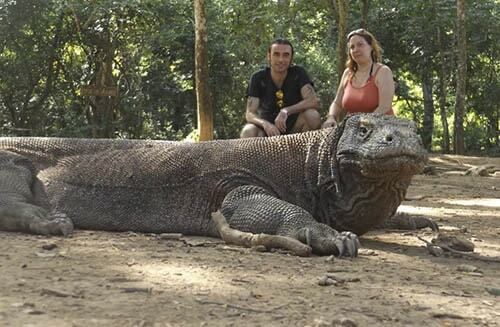 One of the main purposes of visiting Komodo National Park is hiking at Komodo island to find the giant lizard. Treking on Komodo Island to find a giant lizard called Komodo, the island is dry and it is hot. Komodo Dragon is technically deadly to humans, but the guide holds a long stick to protect you. Pink Beach is located on Komodo Island. Here you can swim, snorkeling, sunbathing and taking pictures. Diving and snorkeling at Manta Point on Komodo island could be a great thing to do on your vacation. Hiking on Padar island for a beautiful sunset, here you can take pictures. Snorkeling and diving on Kanawa Island or just hiking on the small beautiful hill. Kelor island is also the best spot for snorkeling and diving. Hiking and enjoy the beautiful landscape of the hill and take pictures. Hiking on Rinca island to find other giant lizards. Visit Traditional houses of Manggarai in Wae Rebo. Visit Cunca Wulang waterfall, having shower and pictures. Sunset at Bukit Sivia Labuan Bajo. Visit Kelimutu, the three colored lakes in East Flores. Hiking on Rinca island is part of your Komodo island activity. It must be a great thing to do as the island is not only the place to find the dragons. But rather than that, there is also found the beautiful hill on the island. Rinca island is known as one of the Komodo Dragons inhabitants. Here are living over 1500 Komodo Dragons. On Rinca island, you will also find the other wildlife living, such as buffalo, deer and many more. You need to hike for about 1 1/2 hours, Find the dragon spot and hiking to the top of the hill. Capture every moment you have, and feel the breathtaking view of the island. To book your activity, you need to go to Komodo island tours for a great arrangement. There are varieties of tour packages which and things to do on Komodo island tours.